3. Find a beginner project: All the kits on What Jane Knits are designed especially for beginners. However you may want to dig out an unfinished project you have already. For best results start simple and small. 4. Post on Social Media - your intention to start/finish your knitting project. I suggest an using an Instagram account and include the following hashtags #wjknewbie and #knittersofinstagram #whatjaneknits. There are many knitters online and they are a great support network. 5. Ravelry - it's like the Google/Facebook/Wikipedia for Knitters. Create a free account and have a look around. There is a link to the Ravelry page on the purse image - you can get a free pattern there. 6. Finish your first project - YAY!! Don't forget to post a project on Facebook, Instagram and/or Snapchat! 7. Learn a new technique. For your next project, choose something that uses a technique you haven’t used before. If you have just knitted plain/garter stitch then try rib knitting. Moss stitch is simple and fun and has a gorgeous look to it. Maybe you are jumping ahead to knit a Cable project! If you knitted a scarf, knit a beanie next! 8. If you get stuck on anything don’t just leave it languishing in a bag. Ask a friend or relative for assistance or Email me on jane@whatjaneknits.com and I’ll try and help you. 9. Take your knitting out and about… Knit on public transport, in the park at the beach or cafes! Don’t hide your knitting. Share it with your community. You’ll be surprised at the number of friendly comments you receive. 10. FINISH your next project. 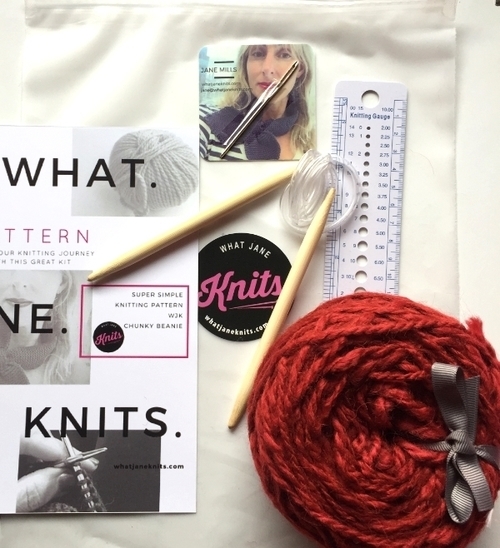 Now you are now a knitter… how exciting is that! Very bragworthy indeed! When I talk with people about knitting and What Jane Knits, the first thing they ask is: Can you knit me a ... scarf/jumper/beanie/thing? This is fine, and very flattering that they think I am able to just whip up a knitted garment for them. Then I explain, no I don't actually knit the products for people, I supply kits. Here's your beanie. Hope you like the colour! Overwhelmed and Confused: I saw that people were interested in knitting, but not sure where to start. Sometimes they didn't live near a Wool shop or others just felt overwhelmed with the range and options available. Overambitious and Unlikely to finish: Then there were people who were very keen to start so went to the local store and bought hundreds of dollars worth of yarn and needles and books to make that amazing blanket/throw they had seen in a magazine. Out of practice: Often people learnt to knit in childhood and haven't touched a knitting needle in 30 years. New babies are often the inspiration to pick up the craft again. Craft enablers: Sometimes people see the creativity in others and like to encourage them. 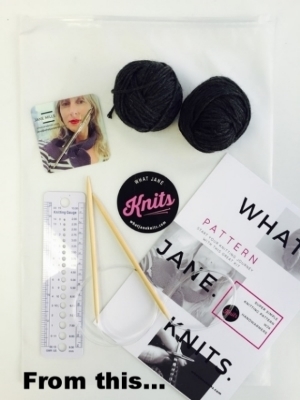 Hopefully a What Jane Knits kit will provide a beginner knitter the perfect introduction to knitting. I have sourced quality yarn - mostly Australian merino, but some Italian alpaca. The circular needles allow the beginner to slide their knitting down on the cord when they take a break so the stitches don't fall off. The waterproof, zip-lock little project bag is great to put in a tote and take with you when you travel. Most importantly the patterns are designed to be straightforward and easy to follow. The projects are small to encourage you to finish the product. Being happy with the results of your labour is so very rewarding. These days many people share their knitted projects on social media... it is all part of the feel good factor associated with creativity. Sharing your work and getting positive feedback, even from strangers is exciting and encouraging! Hopefully Beginners will gain confidence and continue to knit ; gradually learning new techniques and trying more advanced projects. So whilst I am very happy to knit my friends and family a few gifts, I certainly prefer if they pick up the needles and have a crack themselves! Like any new activity your knitting is unlikely to be immediately perfect - but hopefully the WhatJaneKnits kits will help you get a pretty good result you are happy to share.